How do I create and use custom fields? A custom field can be used to personalize your message for each contact. The usage code added to the email will be replaced with the specific contact data you have saved for each subscriber. 1. Creating Custom fields under Contacts>>Custom fields. To create a custom field, choose Contacts in the dashboard menu and go to Custom Fields. Type in the custom field name (lowercase letters only) and choose the type. Country – a single select drop down list of countries. You define what countries are shown in the list, all you need to do is to deselect the checkboxes in the Custom field value section. – text and text area – for providing their own answer, perfect for open question type. Click Save custom field to save it. All the custom fields you have created in your account are available at the bottom of the page. 2. Collect subscriber data by adding the custom field to your web forms. You can create custom fields while creating any web form, all you need to do is to click Add new field available in the Design step. Open template of your choice in the editor and scroll down the Add field section. Click Create new to open a custom field pop-up. Provide the name of the custom field, choose type, format and save it. 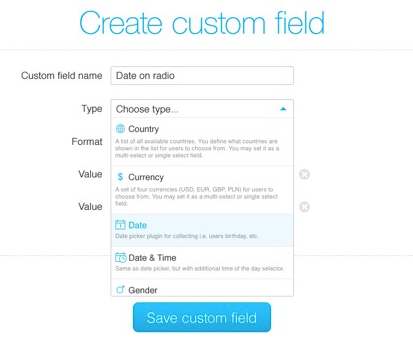 The custom field creator looks and works exactly like the one explained in point 1. Click here to read more information. 3. Assign custom field values manually. If you use import subscribers, you have the option to import any additional data on file for each new contact. You can also assign custom field value manually to any search results by choosing Add custom field under Action list on the left side of the screen. 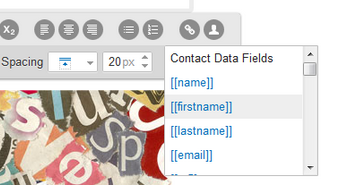 In the new pop up window you will have the list of your current custom fields ready to be assigned to the contacts. To add custom field value to particular contacts only, check the boxes beside them and use the Actions list at the bottom of the page. Personalize your messages by displaying custom information for each contact to increase the response rate dramatically. In the Email Creator editor, click the Person icon on the right side of the row of editing buttons. Choose any field you want to use in the mailing or type the usage code manually e.g [[age]]. You can also personalize the subject of the message by typing the code manually or click the Personalize link. More information on personalizing the messages can be found here.